You’ve just signed up to play Ottoneu – now what? Ottoneu is growing, and while you’re going to see a lot of ink spilled here on RotoGraphs about this premier fantasy game, the learning curve for rookies can be a little steep. Below are ten critical tips you should consider when embarking on your first Ottoneu fantasy baseball season. What follows is based on the assumption that you’ve either joined an existing Ottoneu league or are creating a new league and are now preparing to draft in your first spring auction. One of the best aspects of Ottoneu is the massive contingent of game players discussing all things baseball (and football) 24/7/365. You can find the most active Ottoneu gamers on the official community site and on Slack, which we’ve hijacked for all things Ottoneu, now with well over 1,000 members. 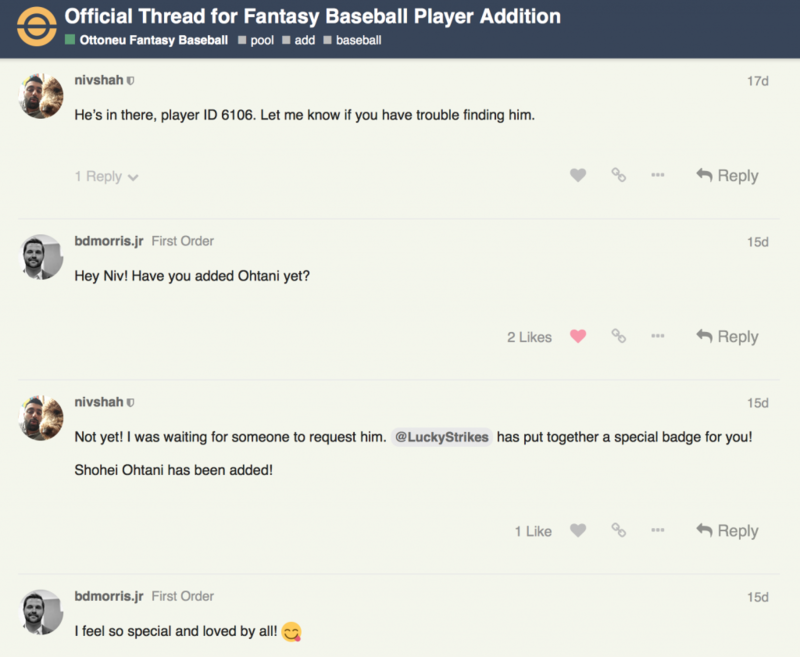 Complementing the already feature-rich platform, the Ottoneu community brings all owners together in one place to crowdsource player information, trade feedback, auction tips, keep/cut decisions, enhanced league communications, and a forum for recruiting new league owners. Even if you don’t play Ottoneu (yet), the community is a goldmine of daily baseball dialogue, strategy, and advice, and it also the perfect place to dip your toe in if you have any interest in learning more about playing and joining Ottoneu. When you do play Ottoneu, you’ll want to get acquainted with the community as soon as possible, as it is an excellent resource for new Ottoneu players. Ottoneu offers some excellent scoring formats, an amazingly deep player pool, and an advanced level of competition that is perfectly suited for you, the RotoGraphs reader. But like most fantasy formats, your league is still only as good as your ownership group. Don’t underestimate the value of getting to know each and every owner in your league on a personal level, because over time Ottoneu may begin to feel like the best poker game you’ve ever played. Take the initiative to introduce yourself to your new league mates through your league message system or via the community. Be engaged, be responsive, and be ready to challenge everything you think you know about fantasy baseball. This is the final day you’ll have to decide which players you plan to keep or cut before your spring auction draft. You cannot trade or cut players between the keeper deadline and the close of your league’s auction draft. While you can certainly cut players before the keeper deadline, it’s to your advantage to keep all your players rostered for as long as possible as to not give away your hand to the rest of your league (and you never know if you might be able to trade a player you had planned to cut). If you’re struggling with a decision to keep a certain player, you can crowd-source the decision within the community. Most leagues select a March auction date convenient when convenient with your league. It’s not always easy to find a date/time that works perfectly for everyone, so be as flexible as you can and plan early, which means communicate with your leaguemates frequently. You can find your auction draft date and time on your league Calendar. Final day to trade players during the MLB season. Your next opportunity to trade players will be after the close of the annual arbitration process (November 15th). Your league trade deadline could be impacted by the introduction of H2H playoffs (coming in 2018). Your league will use one of two distinct arbitration formats that both require 30 days to complete the process. You can find more about arbitration strategy here, but just remember you cannot trade players during this window and you do not want to cut players before arbitration begins. 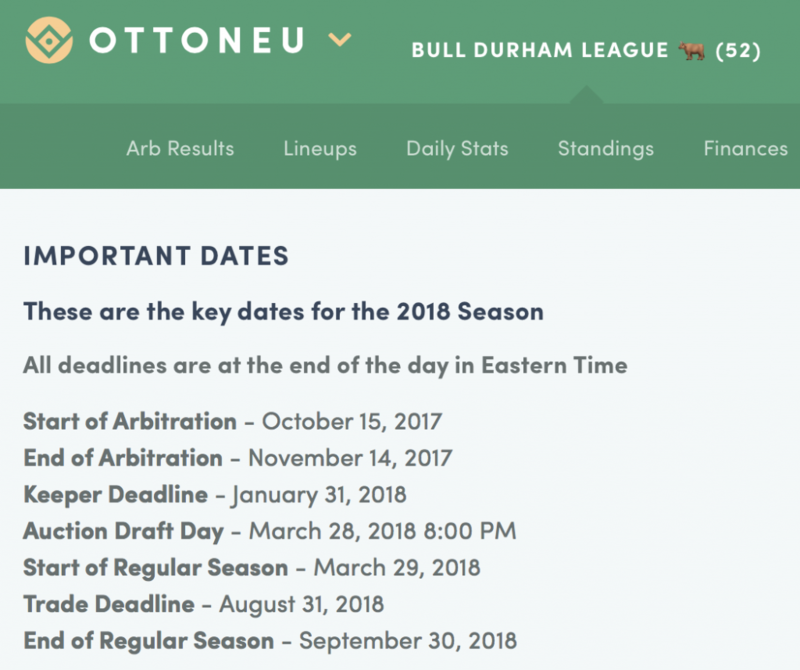 With arbitration complete, the full “off-season” begins, which allows player trades between teams until the keeper deadline at the end of January. The Roster Organizer is an expanded version of your team lineup page that is available in the off-season to help plan what your team may look like after the keeper deadline (1/31). 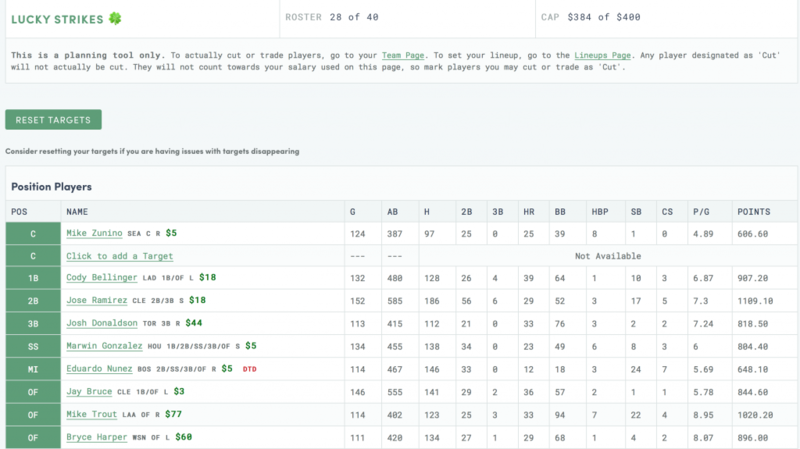 The Roster Organizer is private (cannot be seen by other owners), and allows you to designate which players you plan to keep (by position), “cut”, or “trade”, so that you can see the financial impact on your roster budget ($400 maximum) before entering your league auction draft. You will want to update your Roster Organizer frequently throughout the off-season as you trade and acquire players. 1a: Each team should maintain a roster of 22 major-league players that can fill out a starting lineup. The remaining 18 roster spots can be used for reserves, consisting of both major and minor leaguers. 4b: There is a 162 game maximum for all positional players and a 1500 inning maximum for pitchers. 1b: If at any time during the season any team’s cap room is not greater than or equal to 40 minus the number of players on that team’s roster, you cannot field a team. In this circumstance, your team will be frozen until the issue is resolved. The owner will be forced to cut a player to resolve the issue, and will not be able to perform any other activities in the game, including editing and making auction bids. Played in 10 or more major-league games at that position in the current or preceding year. Started at 5 or more major-league games at that position in the current or preceding year. Played in 20 or more minor-league games at that position in the current or preceding year. 5a,b,c: If you wish to add player to your roster, you must start an auction for the player, and bidding will end 48 hours after the start of the auction. The player will be awarded to the owner who bids the most for the player, with any ties going to the team lower in the standings. The player is awarded to the team who has made the highest bid, and his salary is $1 more than the second highest bid. If two teams are tied for the highest bid, the player salary is that amount. 5d,e: When a player is dropped, other owners have 24 hours to claim the player on waivers for 100% of his salary. If a player passes through waivers, 50% of his salary (rounding up), counts against his previous team’s salary cap as a cap penalty, until he is claimed by another team or until the end of the current season. Any bids for him as a free agent must be at least 50% of his previous salary. The team that dropped the player may not bid on the player until a month (30 days) after the drop date. 6c: Salary cap dollars can be traded between teams (i.e. team A can agree to count one half of a traded player’s salary against their cap). However, these loans will not remain in place once the regular season ends. 7d: The allocation system gives a $25 budget to each team in the league. The team can allocate this budget towards players on other teams. Each team must allocate at least one dollar to every other team, and no team can allocate more than $3 to any other team. Updating your Trade Block is a great way to send signals (a notification is posted to the league home page) to the rest of your league that you are shopping various players or looking to reinforce positions of need via trade. You should update your Trade Block frequently and be as specific as you can if your goal is to invite trade discussion from your competitors during both the regular season and off-season. You can see each owner’s Trade Block on their Team page, or see all teams together on the Trade Block page. The Ottoneu player universe is vast, and incorporates both MLB and MiLB. You can auction just about any player you can find, and can even request to add eligible unlisted players here. But knowing how all these players rank and relate to each other within your league’s specific scoring system is a bit more difficult, so the following two resources may help. You can also export all these players to csv to dig into player information, average salaries across leagues, position eligibility, ownership rates, etc. 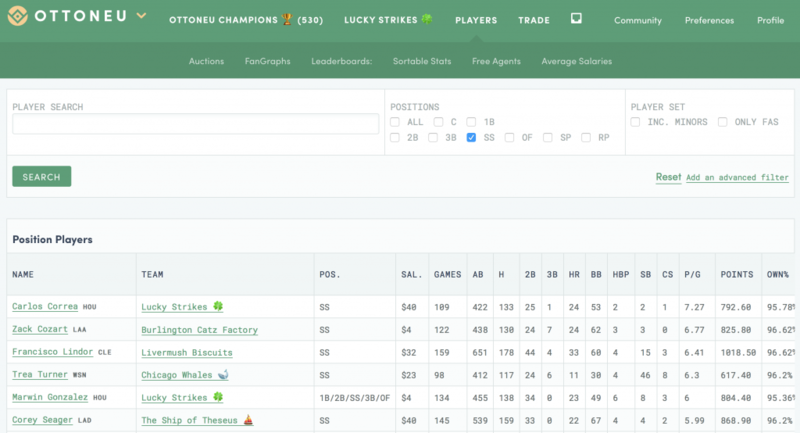 In addition to the resources and rankings above, you’ll want to visit RotoGraphs often to get the most customized Ottoneu tools available to help you gain every possible edge you can to compete in your league. If there’s something you need that might be missing here, let us know in the comments. You cannot cut or trade players during the auction draft. 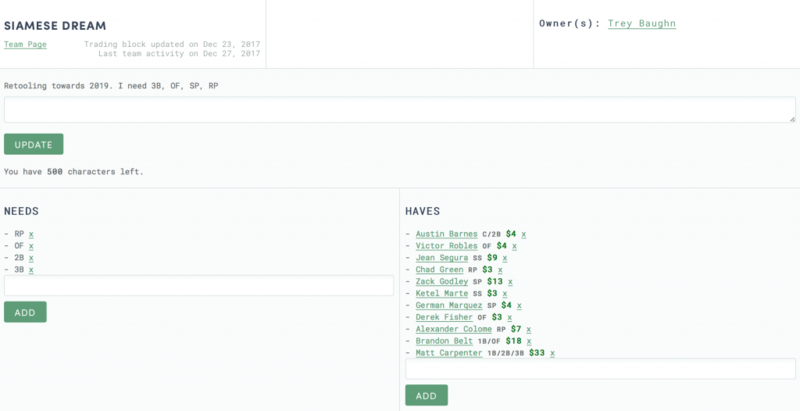 Players you win in the auction will be immediately added to your roster, so you can use the Roster Organizer during the draft to review your positional needs and remaining budget. By default every empty roster spot on your team (40) automatically counts $1 towards your $400 salary cap. This is important to remember because if (example) you find yourself in the draft room with $5 left to spend and 5 roster spots remaining, you will not be able to win a player > $1. Most teams will want to exit the auction with $10-$20 of their budget remaining to make roster adjustments during the season. Once you run out of money ($400 budget) or roster spots (40), you can no longer nominate or bid on players in the auction. Also, if you miss a player nomination during your turn, you’ll be assumed to have finished your draft and won’t be able to nominate again without commissioner intervention, so be ready and pay attention! The auction player queue will show you which players are available, but it won’t show you projected stats or scoring, so many owners will make their own spreadsheet of projections to quickly review when comparing between two players who may be available in the draft. If you’re playing #FantasyBaseball this season, you should get started by playing @fangraphs @ottoneuBaseball https://t.co/U5PXj3LZaW ⚾️? You’ve made the right decision to play Ottoneu this season, so hopefully these tips will get your started on a successful transition to a great fantasy baseball game. We hoped you liked reading 10 Tips for Ottoneu Rookies by Trey Baughn! I’m interested in slack. How do I join?